Christmas truly is the most wonderful time of year, and LawnSavers Christmas Lighting and decorating professionals are going to make it even bigger and brighter for one special family in 2018! LawnSavers Christmas Decorating professionals want to share the joy of the season, so we created an exciting contest for your children to participate in AND the winner will receive a Special Custom Decorating and Lighting Dream Package for your house valued at $3500.00! Have your kids enter the LawnSavers Christmas Decorating Colouring Contest, and our special judging panel will choose a lucky winner for the grand prize on December 15th 2018! – age groups 0-4, 5-7, 8-10 will be separated into 3 groups. – our staff will choose their favourite top 5 drawings in each group. – one (1) top prize winner will be selected in a random draw from the combined 15 top entries for the first prize. – two (2) other winners from the remaining 14 entries will win a kids gift basket valued at $100.00 each. The winner must be located within our service areas. Click here to download the drawing in Adobe PDF format. Click here to download the drawing in JPG format. LawnSavers Plant Health Care Inc. (“LawnSavers PHC “) is offering this contest (LawnSavers PHC referred to as the “Contest Organizer”). The LawnSavers PHC Colouring Contest begins Nov 1st, 2018 and closes at 12:00 p.m. Eastern Standard Time on December 15th, 2018. Contest is open to any persons who are ten (10) years of age or younger and who reside in our service area https://lawnsavers.com/pages/organic-lawn-care-experts-in-the-greater-toronto-area.html (each a “Contestant”), except those persons who are employees of LawnSavers PHC and the immediate family members of such persons. Contest prize is awarded only within that service area. Post your kids entry on FaceBook! All entries must be received on or before 12 p.m. Eastern Standard Time on December 15th, 2018. Contest Organizer will not be responsible for, or accept any liability resulting from contest entries which are delayed, lost stolen or misdirected for any reason. All entries received have an equal chance of winning. The chances of winning depend on the number of entries received. 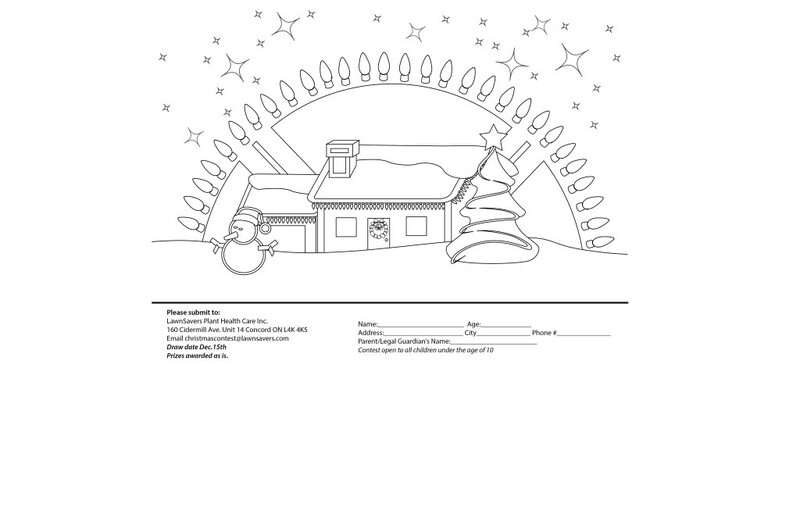 No purchase is required to enter the LawnSavers PHC Colouring Contest. There will be three (3) prizes (each a “Prize”) awarded as per below. The Grand Prize will consist of: LawnSavers PHC will decorate your home with a combination of Roof lighting, Tree Lights, Garland and a wreath up to the prize value. (Value is one year rental only up to $3500.00) LawnSavers retains ownership of all the materials. Prize value is calculated based on Labour and rental fee of decorations for 4 weeks. Two (2) secondary prizes will consist of: a kid’s gift basket valued at $100.00 each. The winners of each Prize will be randomly selected from all eligible entries as determined by the judging panel. The draw for Prizes will take place on December 15th, 2018. The Contest Organizer will contact the Prize winners by telephone. If for any reason and despite customary diligent efforts, it is not possible to contact a Prize winner within a period of forty-eight (48) hours after the Prize draw, the Contest Organizer reserves the right to disqualify that entry and select another entry by random draw as a Prize winner. The legal parent and guardian of each Prize winner must sign a contest prize acknowledgement and release before the Prize will be awarded. Prizes must be accepted as described; substitutes by the Prize winner(s) will not be allowed and may not be transferred to other persons. Prizes are subject to their conditions of use and have no cash value. Contest Organizer retain the right to replace the Prize with a different prize of equal or greater value if the original prize becomes unavailable for reasons beyond the Contest Organizer’s control. NO CASH SUBSTITUTION available. By entering the Contest, all entrants agree to be bound by the rules of the contest and release the Contest Organizer and all parties associated with this Contest from any liability with respect to the contest and the redemption of any Prize. Contest Organizer reserves the right to withhold the Prize or disqualify any Contestant’s entry in the event that any Contestant fail or refuses to comply with these contest rules. By entering this contest, Contestants and their legal parent(s) or guardian(s) consent to the Contest Organizer publishing or announcing any Prize winners’ name and photograph(s), in future publicity, without permission or compensation to the Contestant or any other party. This shall include unlimited reproduction, publication, use and distribution in all forms and media, and in all manners including advertising, trade, display, editorial, art, video production, exhibitions and website content. If for any reason, in the opinion of the Contest Organizer, in its sole discretion, the contest is not capable of running as planned or if the administration, security, fairness, integrity or proper conduct of the contest is corrupted or adversely affected, including by reason of infection by computer virus, bugs, tampering, unauthorized intervention, lack of entries, fraud, technical failures or other causes beyond its control, Contest Organizer reserves the right to cancel, terminate, modify or suspend the contest including any method of entry. Any inquiries or concerns relating to the contest should be addressed to LawnSavers PHC. This contest is subject to all applicable federal, provincial and municipal laws and regulations and is void where prohibited.